You likely have noticed different symbols and numbers on various plastic bottles and containers, but what do those recycling symbols actually mean? Some plastics are safer than others, and if you have a good understanding of common recycling symbols, you can better serve the best interests of recycling and our environment. There are seven different numbers found within triangles on plastic bottles and containers. These symbols were created in 1988 in conjunction with the Resin Identification Code or RIC to help promote plastic recycling through better material separation. The "1" inside a triangle in a plastic bottle indicates PETE or PET, which is Polyethylene Terephthalate. This symbol is normally found in soft drinks, beer and water bottles, ovenable food trays, salad dressing and vegetable oil containers, peanut butter containers, and mouthwash bottles. 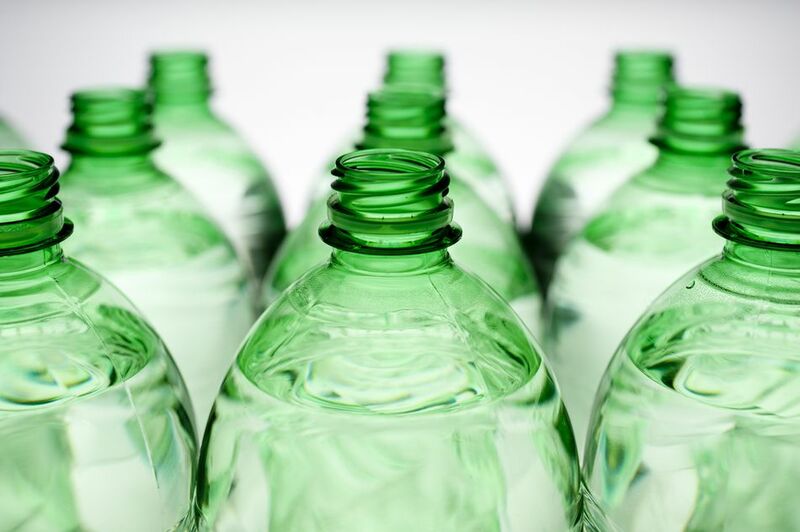 As it is easy to recycle, lightweight and inexpensive, PET is used to produce single-use beverage bottles. These bottles are commonly picked through curbside recycling programs in most countries. PET bottles can be recycled into new containers, straps, paneling, carpet, furniture, tote bags, fiber, and polar fleece. It is commonly considered safe as it poses a low risk of leaching. But it allows bacteria to accumulate. Although there is a high demand for recycled PET the current recycling rate is only around 20 percent. The "2" inside a triangle on plastic container signals High-Density Polyethylene or HDPE, which is one of the three plastic types considered safe due to lower risk of leaking. As HDPE can be recycled into laundry detergent bottles, lumber, drainage pipes, pens, oil bottles, fencing, picnic tables, doghouses, benches, floor tiles, and recycling containers. It is an acceptable item in most curbside recycling programs. You can find HDPE in milk jugs, shampoo bottles, cereal box liners, butter and yogurt tubs, motor oil bottles, shopping and trash bags, and household and detergent cleaner bottles. The "3" inside a triangle on plastic containers signals V or PVC which is Vinyl. Vinyl is rarely recycled and commonly not accepted by any curbside recycling programs. You can find V in window cleaner and detergent bottles, piping, siding, medical equipment, wire jacketing, clear food packaging, cooking oil bottles, and shampoo bottles. From various development problems to miscarriages, V can be reasons for different health issues as it contains phthalates. It also contains DEHA which can be a reason for liver problems and loss of bone mass. For these reasons, never burn or cook with this kind of plastic. A tiny percentage of PVC is recycled into mats, speed bumps, cables, flooring, roadway gutters, mud flaps, paneling, and decks. The "4" inside a triangle on a plastic container indicates LDPE, Low-Density Polyethylene, which is not often recycled through curbside recycling programs. Some local communities, however, do accept it. It is considered as a safe form of plastic. LDPE is commonly found in shopping bags, squeezable bottles, carpet, furniture, clothing, tote bags, dry cleaning bags, and frozen food or bread bags. While it is not much recycled, it can be recycled into floor tile, landscaping ties, lumber, and paneling, shipping envelopes, compost bins, and trash can liners. The "5" inside a triangle on a plastic container means PP or Polypropylene, which is one of the safer kinds of plastics. It is increasingly getting acceptable in curbside recycling programs. PP is normally found in medicine bottles, straws, bottle caps, ketchup bottles, syrup bottles, and some yogurt containers. These PP bottles or containers can be recycled into trays, pallets, bins, rakes, bicycle racks, landscape borders, ice scrapers, auto battery cases, brushes, brooms, battery cables and signal lights. PP is often chosen for bottles and containers that must accept hot liquid as it has high melting point. The "6" inside a triangle on a plastic bottle or container indicates Styrofoam or Polystyrene, which is generally considered to be tough to recycle, due to its low density. It is therefore often considered bad for our environment and has been subject to local bans. You can find PS in disposable cups and plates, compact disc cases, aspirin bottles, carry-out containers, egg cartons, and meat trays. Most curbside recycling programs do not accept PS, but it can be recycled into carry-out containers, foam packing, rulers, egg cartons, light switch places and insulation. Any plastic that does not fall under the above six types has "7" in a triangle on it. In fact, it is a mixed bag of different plastic items that include polycarbonate. It contains toxic BPA which is bisphenol-A. This kind of plastic is very harmful. While nearly no curbside recycling program accepts this material, it can be recycled into some custom-made products, and plastic lumber. Plastic 7 is normally found in nylon, certain food containers, signs and displays, iPod and computer cases, DVDs, sunglasses, bulletproof materials and three- and five-gallon water bottles.